The Bureau of Land Management (BLM) began gathering and removing excess wild horses last week from the Pryor Mountain Wild Horse Range located north of Lovell across the Montana border. So far, three young horses have been captured in bait traps and removed from the range. All three are being held at Britton Springs Corrals, which is located on Crooked Creek Road near the Wyoming/Montana border. All of the horses will be made available for adoption to pre-screened individuals at a future date. The BLM has stated that none of the horses will be slaughtered. Two young stallions identified as Kokopelli and Jumping Badger were the first to be captured and removed from the Pryor Mountain Wild Horse Range last week as part of an effort by the BLM to reduce the population of horses living on the range. 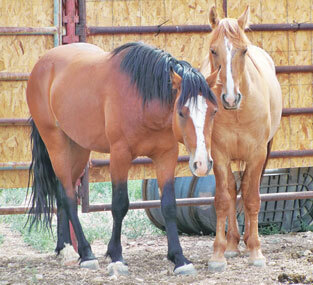 Two young stallions identified as Kokopelli and Jumping Badger were the first to be gathered and removed from the range. The two were gathered on July 11 and 12 from the Cottonwood Springs and Layout Creek trap sites. Jumping Badger is 3 years old and Kokopelli is 2. The third horse gathered on July 16 is a female and is being held in a separate paneled enclosure away from the males. She was gathered at Bad Pass and she is known on official BLM records as Leisel. According to records kept at the Pryor Mountain Wild Mustang Center (PMWMC), she is a yearling offspring of the stallion Bristol and the mare known as Greta. Lori Graham, director of the PMWMC in Lovell, and other wild mustang advocates visited the horses at Britton Springs Corrals. Graham said the female looked “beat up, like maybe the other horses on the range had been picking on her.” Graham said she thought the male horses “looked good and seemed very calm” considering their ordeal. “It looked like they were adapting well. They weren’t running around or going crazy or anything,” said Graham. Graham and other horse advocates plan to visit the horses several times a week until they are adopted. They have also offered to help the BLM staff “gentle” the horses. During the bait trap gather, which is expected to last most of the summer, Britton Springs Corrals will be open to the public to view the wild horses that have been removed from the range. Public viewing from bleachers near the corrals is from 8 a.m. to 4:30 p.m. on Monday, Tuesday, Thursday, Friday and Saturday. Corral tours on Tuesday and Saturday at 10 a.m. allow a closer view of the horses. According to a recent BLM census, 150 adult horses live on the range, which exceeds the ideal number or AML (Appropriate Management Level) to support both a healthy range and a healthy herd on the 38,000 acre range, which is fenced. The census does not include foals, which are estimated currently to be about 21. Based on previous research conducted by the BLM, the range can support approximately 90-120 adult horses, excluding the foals. The BLM proposed the gather earlier this year to reduce the size of the herd. Several comment periods allowed the public to provide input into the methods the BLM plans to use to gather the horses. The BLM concluded that bait trapping, water trapping, herding or a combination of these techniques to capture and remove the excess number of horses from the herd is the best method to use to remove horses from this particular herd. A list of the horses gathered and removed (with their given names as identified in the Environmental Assessment) is available on the BLM website, along with information about how to adopt the horses at http://www.blm.gov/mt/st/en/fo/billings_field_office/wildhorses.html. The list is updated every Friday and includes notes about the condition of the horses as they are gathered. As the gather progresses, a daily update is also available with other details about the gather at the website. “Bait trapping is a long-term gathering method, so though it appears to be a slow moving process as far as numbers gathered each day, we are hoping that at this pace we will gather as many as 40 horses by the time the summer months end,” explained Kristen Lenhardt, spokesperson for BLM Montana/Dakotas. The BLM will continue to work the Layout and Bad Pass trap sites at the lower elevations this week. Gathered horses are being transported on the same day to Britton Springs, where BLM staff is monitoring the site, said Lenhardt. Trap sites the horses are not heavily utilizing will remain open for the horses to pass in and out. The PMWMC and other horse advocates provided information about which horses would be the least detrimental to remove from the gene pool. The BLM is using this information plus information from its own research to determine which horses will be removed and which horse will stay on the range. Graham hopes that the fertility control program that is currently in place will reduce the need to gather and remove horses in the future. 150 horses is bare minimum for genetic viabiltiy. THERE ARE NO EXCESS HORSES – THESE HORSES ARE BEING STOLEN FROM THEIR LEGAL DOMAIN. PZP treated mares are NOT reproducing. Cloud Foundation reported zero population growth rate in the past year.